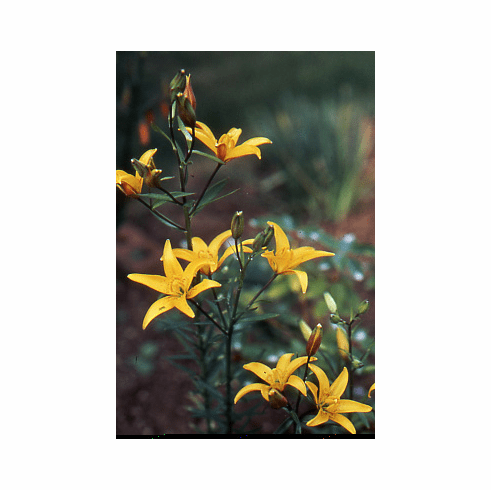 The yellow and even more lovely form, this variant is also short lived, but is easily grown from seed. As with the type, it is well suited to the rock garden, flowers in June and July atop 12 to 36 inch (30 to 90 cms) stems. Seed ripens in mid September and is immediate epigeal in germination. We have always taken pleasure in flowering this species and are very careful in making sure seed is collected for a future planting as bulbs are often short lived. Photo shown is of a stem grown by the late Ed McRae at 'Lava Rock Nursery' where he kept most of his species collection for propagation. Inset photo is from Gene Mirro of this lovely yellow variant in his garden. Copyright Gene Mirro, all rights reserved. Used with permission.